Last weekend I saw on discovery channel that how these wooden skis are made. They are followed by most modern techniques and measuring tools to ensure your safety. And that’s why they cost a lot so don’t count them as an ordinary wooden item. Once you have paid for this, one would never want to just trash them out when they are broken and not in use any more. So this is a great idea to recycle them in making some epic artistic items. Many of those items are being presented here just as a basic inspiration. 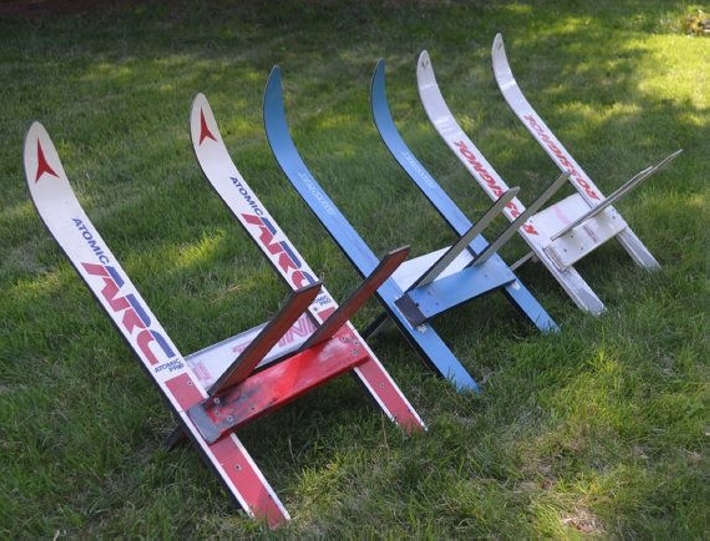 Try recycling them if you have some spare of broken skis with you guys. 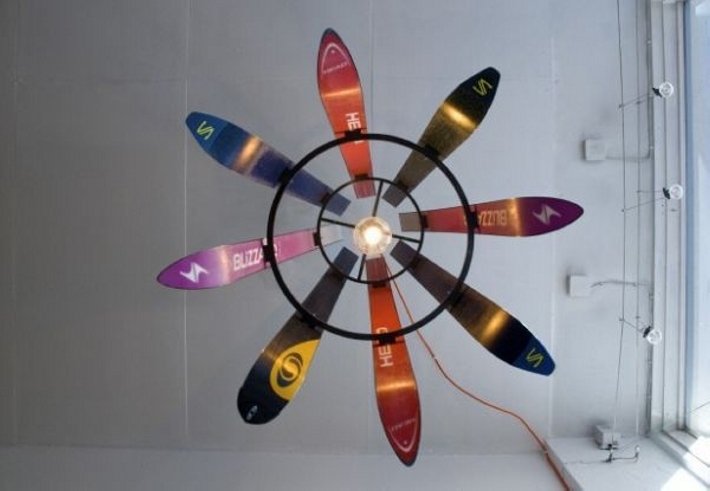 A lamp recycled with these wooden skis would be totally a crazy idea for many of you, but I hope the moment you are done with its recycling you would enjoy it hanging inside your room. 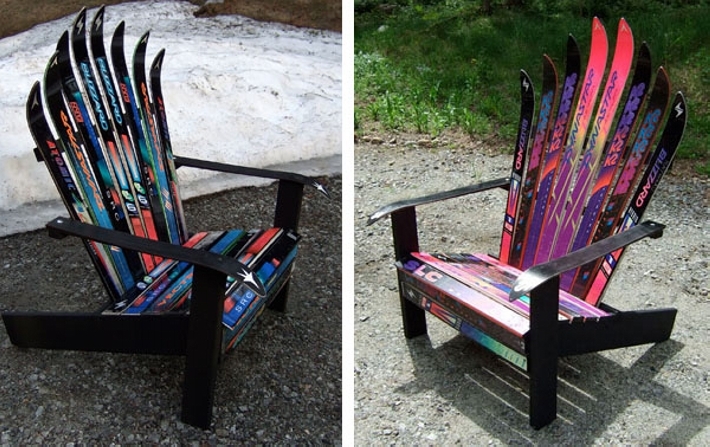 What you guys say about these skis recycled wooden chairs? 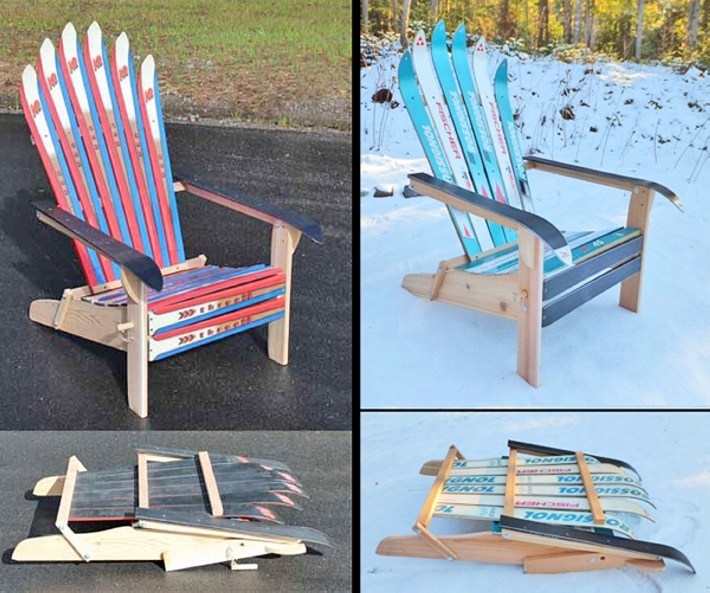 The lower frames are reclaimed from some old broken chairs, and the seats along with backs are made using the wooden skis. 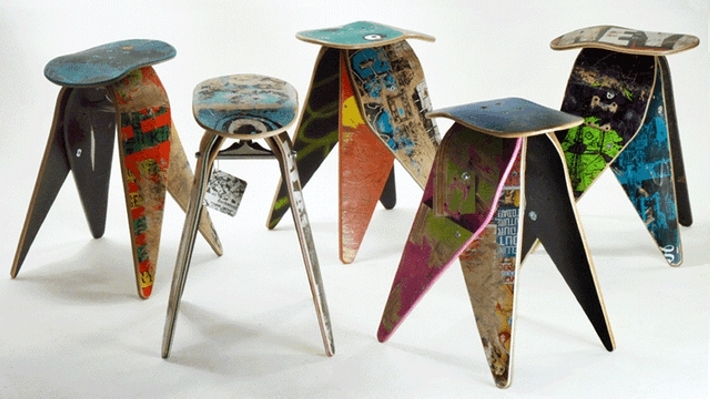 They were already shaped in a beautiful manner sloppy from the end that added much beauty to the recycled chairs. Ok, now here is a project for those who want to bring their life in order. 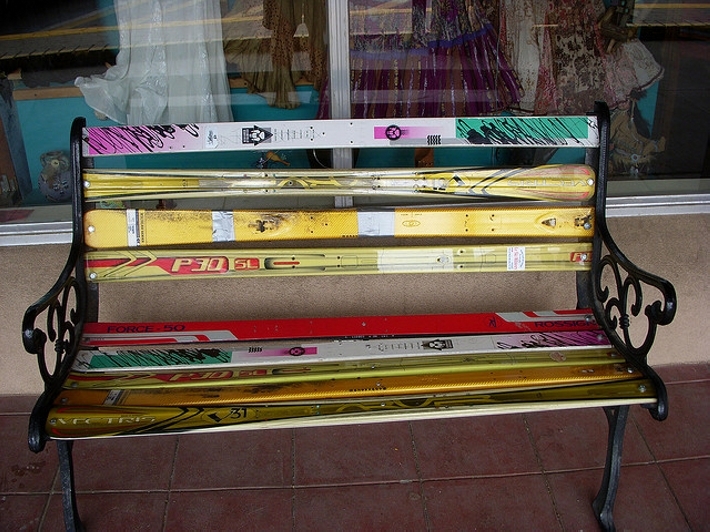 They can never tolerate the messy look inside their rooms, this skis recycled wall rack would bring your room in order, you can hang a couple of accessories on this rack, just add a couple of hooks on the skis. 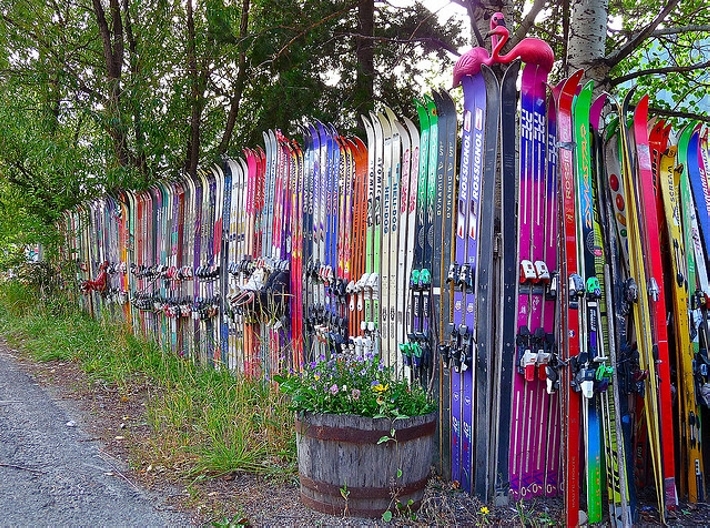 Well, if you are interested in the fencing using recycled skis, just bear in mind that you are going to require some larger amounts of skis because it takes a lot of timber to enclose some larger areas. 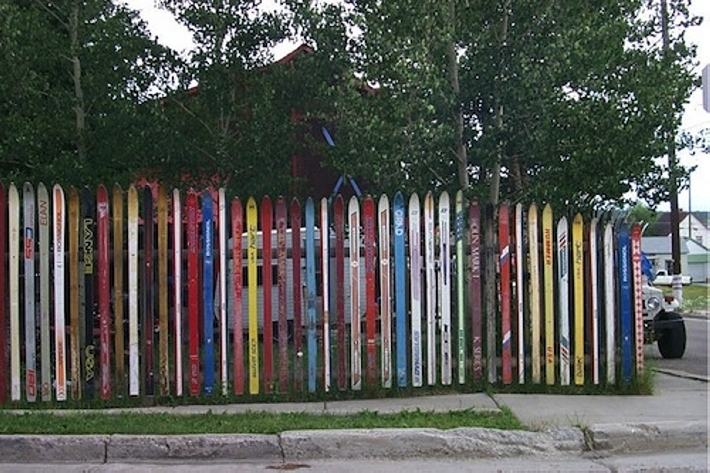 But one thing is pretty clear, fencing done with recycled skis would simply be outstanding. 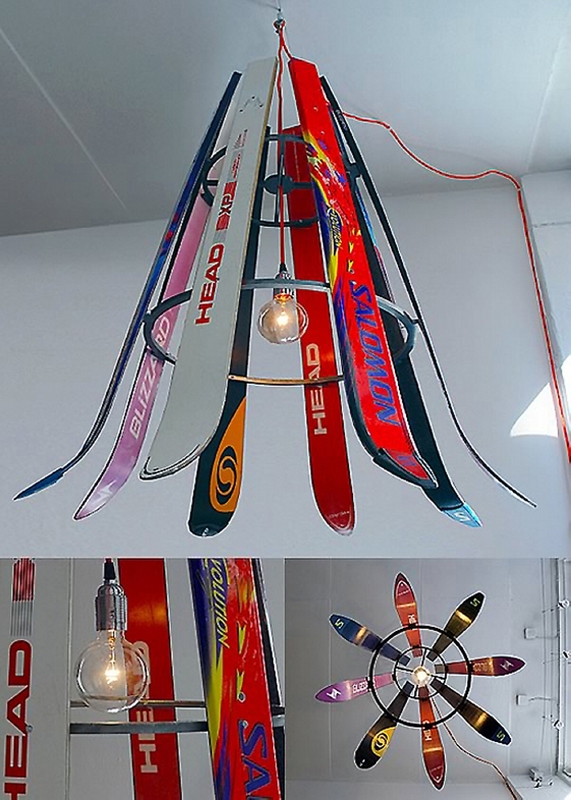 Have a closer look on the skis recycled room lamp, the most prominent feature in this lamp are the same colorful skis that we had gathered to recycle. 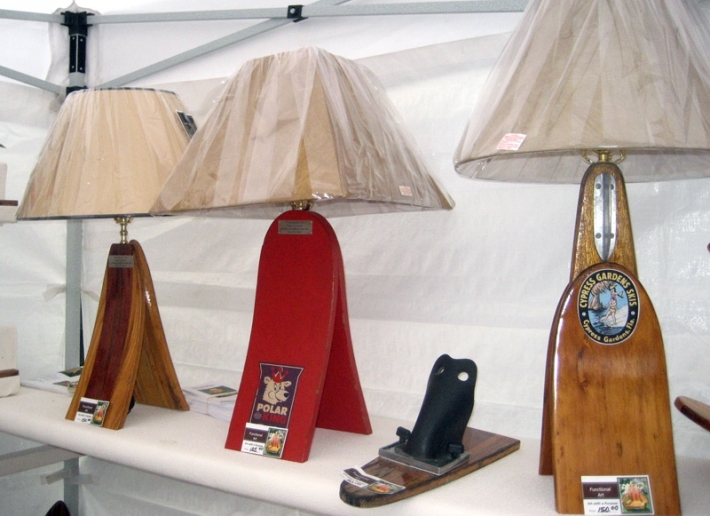 While the inner metallic frame is mere support for the lamp. 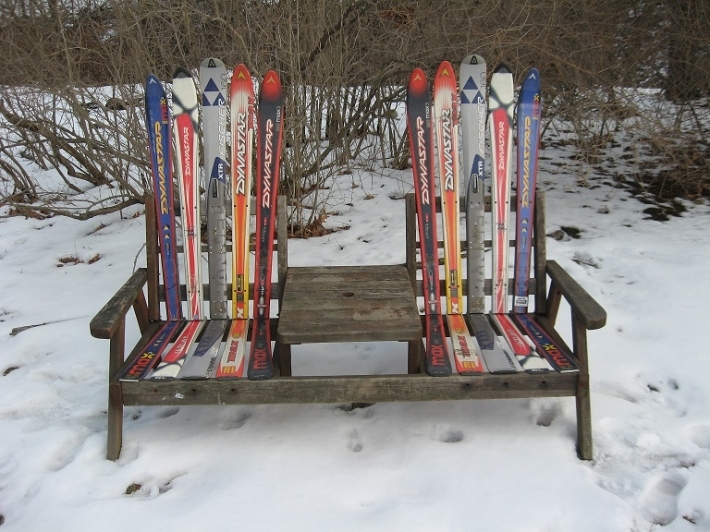 While skiing in the snowy area, sitting on this skis recycled wooden bench would simply be great idea. 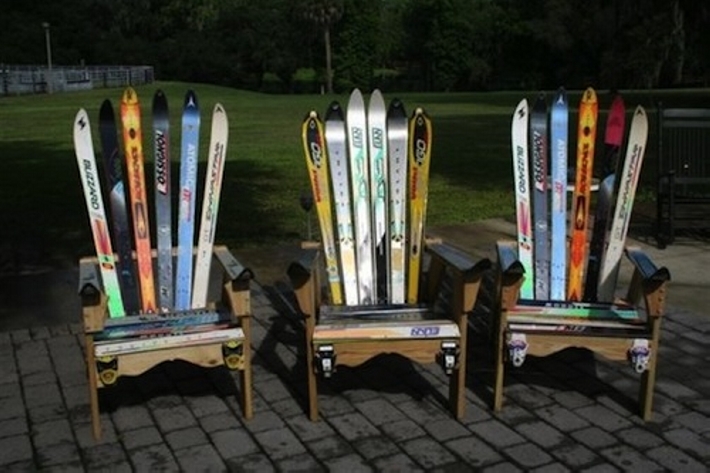 This would show that some great skiing competition is going on over here. 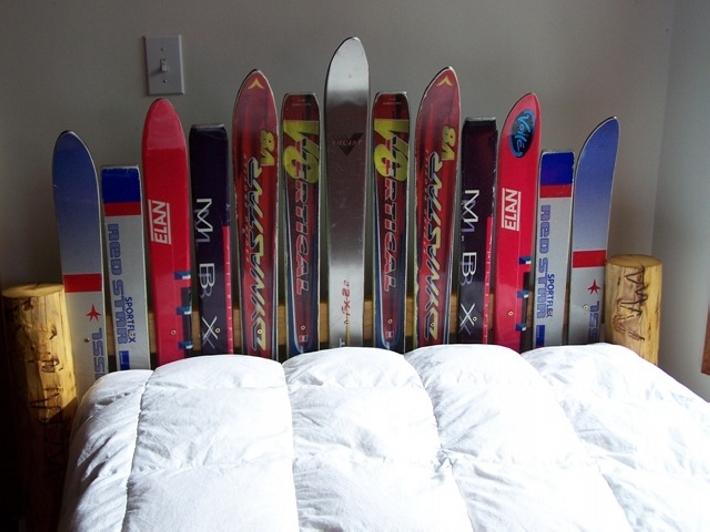 And another great thing about skis is their strength, they can tolerate much heavier weights than the regular wooden planks so this is also an assurance for the strength of the wooden article. I would say that shipping pallets have literally spoiled us, we try some craziest ideas using the same shipping pallets because they cost us almost zero. 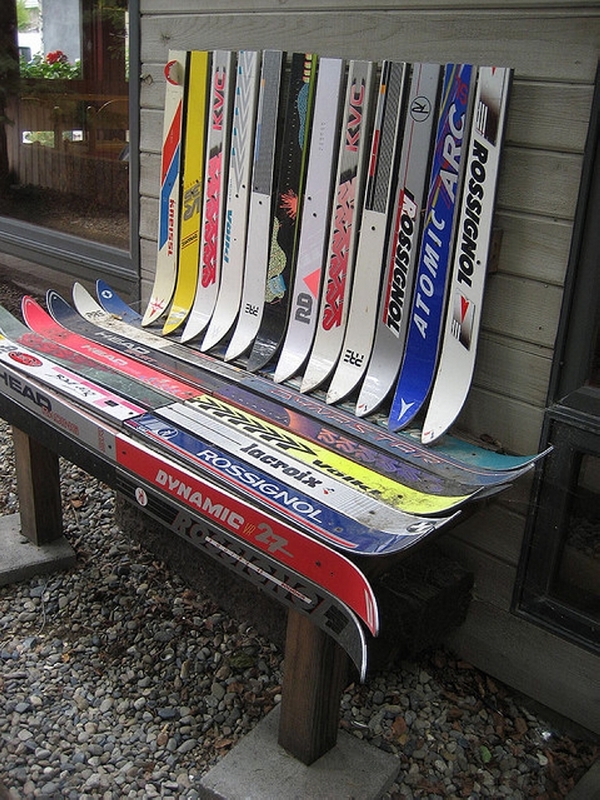 But this time be a bit reluctant while recycling the skis because it would take a while to collect them in such larger amounts. 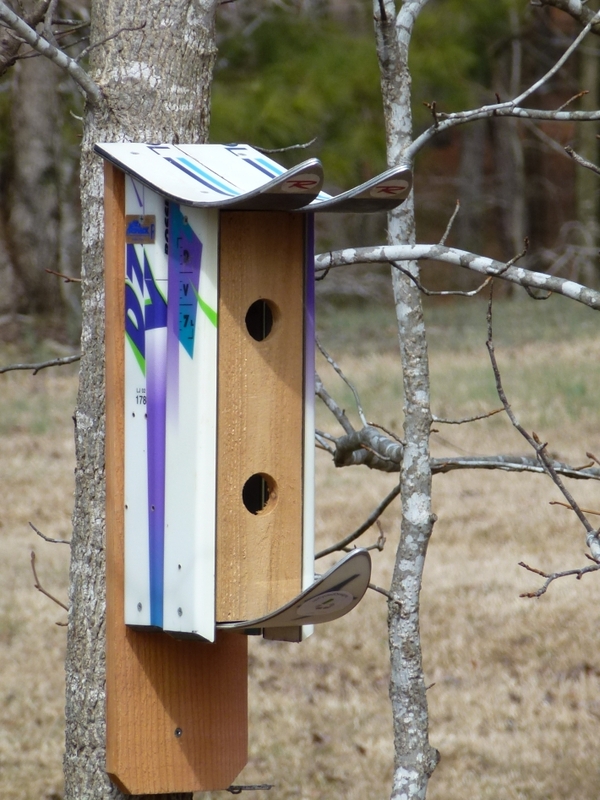 And on the end, using the repurposed skis in recycling a bird house is sheer compassion for these living beings. This is just like sparing some dearest thing of yours in doing some positive work. At the same time this is a great demonstration of fine recycling skills.